Cause uncertain but the effects are clear to see. A viral video from a cellular repair shop’s surveillance camera is making the rounds, showing a potentially dangerous explosion. 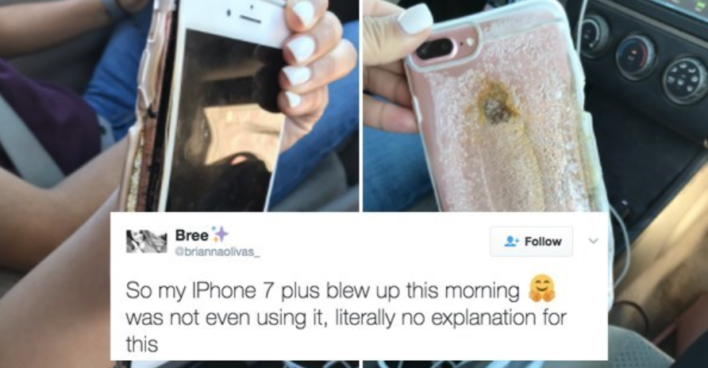 In the video, an employee of the Las Vegas shop can be seen working at a counter–some accounts say he was replacing a cracked screen on another handset–when a phone further down the counter simply burst into flames and rattled nearby items. The store hasn’t formally stated what happened to cause the explosion, but other experts have weighed in on the possible cause. Most sources agree that overheating led the battery to expand, which usually causes the screen to crack and the case exterior to be compromised for dust and moisture. In rare cases, an explosion can occur, as the video shows. Some of the chief culprits behind the overheating are usually being left in a hot vehicle or being charged with an off-market charging device like a portable battery or wireless charging mat. Some users have reported that the stylish acoustic bowls that help amplify the sound from the device’s incorporated speakers have also led to heating up the handset beyond typical temperatures, possibly from trapping heat generated naturally by the phone while in use. iPhones have an internal sensor that can alert you to dangerously high temps. Some experts warn that once you’ve seen that temperature warning a few times over the handset’s lifetime, you may be drastically reducing its future longevity and functionality. As for exploding, it’s a rare event but at the same time offers very little in the way of predicting when it can happen. If you have to carry or use your handset in a setting that could lead to overheating, take care to keep it in a cool place or move it indoors. It hopefully won’t take an explosion for consumers to realize that the upcoming summer temperatures don’t mix with their favorite gadgets.